Technical manual writers are sadists. I wonder if there is a special school that Technical Writers go to in order to learn how to be as vague and ambiguous as possible without actually lying to their readers? The situation: More alarms going off than in an upmarket Johannesburg suburb on a weekend night. The analysis: Engine is overheating. The reaction: Turn engine off and open engine compartment lid. Stare hopefully into engine compartment for signs that alarms are faulty and nothing is wrong with engine. Strong smell of burning rubber indicates that this is probably wishful thinking. The solution: Get out the Engine Owner’s Manual, read the introductory page which always says something like “Congratulations on the purchase of your quality _____________ made by ____________. We are sure that you will enjoy many worry free years of use from it.” Turn to the index and look for the “trouble shooting” page. Here one finds the first clues that the TW (Technical Writer) is pitching to two audiences. The first being the Complete Idiot and the second being the Seasoned Professional. Nothing in between. This we can deduce from the range of problems listed and their solutions. For example: Problem – Engine does not make running noise. Cause – Engine is not switched on. Clearly, this is for the Complete Idiot. Problem – Engine is overheating. Cause – Thermostat interface with heat exchanger requires calibration with dynamic oscillator. Clearly, this is for the Seasoned Professional. Being neither CI or SP, but definitely closer to CI than SP, I pick out a few words from the proposed solutions to overheating and turn to the back of the manual where one finds page numbers that the parts mentioned are referred to. Success! It seems that the most likely cause of engine overheating is raw water pump impeller failure causing a lack of cooling water to the heat exchanger. The solution seems remarkably easy and I have the necessary spare parts and a well stocked tool box. This should be resolved in a couple of minutes! And, judging from the helpful photographs in the manual, I won’t even get my hands dirty. The reality: Filled with enthusiasm, I assemble the tools that the helpful TW has indicated I will need, locate the spare parts from under a bunk and prepare to “remove the cover plate from the raw water pump”. For this the TW has indicated that I need a flat screwdriver. No problem, I have several of different sizes. Locate the raw water pump. The helpful photograph at the front of the manual shows that it is on the starboard side of the motor, just below the oil filter. Hang on? Why is it below the oil filter? This is a problem. The engine is in the boat’s bilge, below the floorboards, so I am working on it from above. The only possible way of accessing the pump without removing the oil filter would be if the engine was mounted on the saloon table. I haven’t ever seen this in a yacht before. The only way to access the raw water pump is by first removing the oil filter. Here I have two options, quick and messy or tedious and clean. I opt for tedious and clean seeing as the rest of the process will be so quick and easy. Having located an empty oil canister and a sump pump, I empty the entire contents of the food storage locker (aka the cave) so that I can access the port side of the engine and pump the oil out through the dipstick tube. By this stage the job has been on the go for close to an hour and patience is wearing thin. Two liters of old, hot, oil and an hour later, I deem the oil level to be sufficiently low that it won’t pour out of the hole left by the removed filter. Wrong. Why did I bother? Oil all over the starboard side of the engine and into the bilge! To say nothing of over me. Sense of humour definitely in full retreat now. I try to find a positive aspect to this and decided that this would be the best time to do an oil change and replace the filter while I’m about it. Now for the easy bit. Remove the raw water pump cover says the TW. Use a flat screwdriver says the TW. ONLY IF YOU HAVE ONE THAT IS ABOUT 30mm IN TOTAL OVERALL LENGTH! No normal screwdriver will fit in the space required to undo the screws holding the cover plate on! The photograph of the TW with his perfectly manicured, spotlessly clean hands, lies. The TW has an accomplice. The Technical Photographer. Having loosened the screws with the shortest available screwdriver, and taken the screws out with a pair of pliers, dropping three out of six into the bilge in the process, the aforementioned sense of humour has now evaporated completely. I am streaked in old engine oil and sweat and my faithful and encouraging assistant is doing everything she can to not laugh out loud at the spectacle! As I learnt, these instructions were aimed just above the level of CI. They do not mention closing the raw water inlet. That would be too obvious. 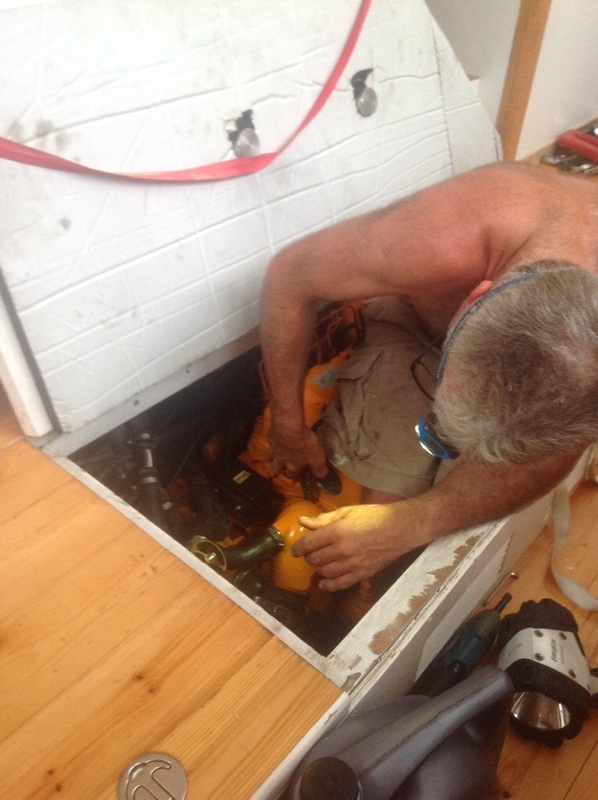 Having stemmed the flow of sea water into the boat, I set about “removing the damaged impeller with water pump pliers”. No ways. There is no physical way that pliers will fit in a gap that a screwdriver cannot. I resort to violence. One large screwdriver makes a satisfactory lever and the offending impeller is removed like a cork from a champagne bottle. “Be careful to remove all fragments of the broken impeller” says the TW. “Some fragments may have made their way into the heat exchanger and could restrict the flow of water through it”. This sounds serious. I find only one small piece of rubber. Clearly the rest of the fragments are lurking in the heat exchanger and that is potentially dangerous. Turning the page in the Owner’s Manual, I find that the next section is conveniently about “Cleaning the heat exchanger”. It looks simple. “Remove the four bolts holding the exhaust elbow onto the heat exchanger block, loosen the two bolts holding the end plates and slide the heat exchanger out of its tube.” How difficult can that be? I will need a 5mm Allen key and a 13mm spanner according to the TW. No problem. These are standard in any toolbox. Except for a few small details. The Allen key needs to be shortened by 10mm if it is to have any chance of fitting between the flange and the bolt of the exhaust elbow. Out with the Dremel drill, load it with a cutting disc and alter the Allen key! “Remove the exhaust elbow and slide the heat exchanger out of its tube.” Or not. Nothing will budge the thing. There is certainly no chance of using my index finger and thumb like the photograph shows! Well, now is the time to use the water pump pliers, and a big hammer! Problem solved. The next step in the manual, according to the TW, is to clean each tube in the heat exchanger with a “pipe cleaner”. The heat exchanger is 600mm long. Whoever heard of 600mm long pipe cleaners and what yacht goes to sea with them on board? A piece of stainless steel wire and some thin cloth will have to do. At least there was another tiny fragment of rubber in the heat exchanger. But where was the rest? The TW warns about the damage that could be done to the thermostat. Damn, where’s the thermostat? It’s not shown in the numbered photos of all the parts of the engine! Phone the dealer in Cape Town by satphone. He doesn’t have a clue! Bugger this! Two hours later and the whole lot is reassembled. Gaskets are made from mouse pads and I’ve got the measure of this TW. He knows as much about engines as I do! It does make me think, however, that back in Korea, where this engine was designed and manufactured, there is an engineer with one seriously warped sense of humour! Author syjerricanPosted on August 25, 2014 September 11, 2014 2 Comments on Technical manual writers are sadists. Why cruising yachtsmen are the ultimate athletes! 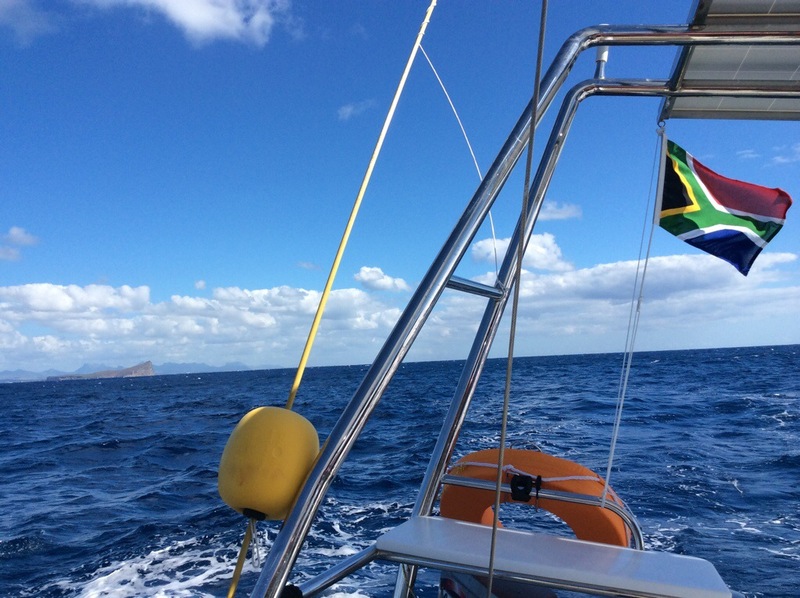 We left Port Louis, Mauritius, on 9 August, bound for Gan some 1450 miles to the North East. The forecast showed moderate South Easterly trade winds all of the way so I expected a 12 day fetch on starboard tack. Which is what we got. More or less! More sea, more wind, less comfort, less sleep! Also, more fish. If I can find anything positive to say about the Indian Ocean, it is that the water is warm and there are very hungry fish in it. Shortly after leaving we lost a brand new lure to a fish that launched itself into the air and snapped a 200lb line! I didn’t see this happen but the crew reported that the battle was entirely one-sided and very brief! Thereafter, we reduced the size of the lure to a more modest offering and caught Dorado, King Mackerel and Barracuda, seemingly at will. Lines only went out when a fish was needed for dinner, and came back in within minutes. Getting back into passage making mode after 5 rather frenetic days of maintenance in Mauritius was not as difficult as it had been at the start of the trip. Maybe we are becoming cruisers after all? Spending 12 days on one tack, in a big rolling cross sea, with the galley a meter higher than the rest of the saloon area is a little taxing however and the slightest lapse of concentration has one hurtling across the saloon trying desperately not to drop or spill whatever you have just prepared with great difficulty! Which brings me to the title of this blog entry. There is no doubt in my mind that yachties are the ultimate evolution of the human species and have evolved to become the pinnacle of physical and mental perfection. To be a cruiser requires poise, balance, co-ordination, timing, strength, speed and agility. And that’s just to get a spoon out of the cutlery drawer without a) losing a finger in the process, b) spilling the entire drawer’s contents or c) ending up with whatever you were about to eat plastered all over yourself and the saloon! Combine these traits with the ability to detect free wifi and cheap beer from a range of at least a mile, and I reckon you almost have perfection? Author syjerricanPosted on August 25, 2014 August 25, 2014 2 Comments on Why cruising yachtsmen are the ultimate athletes! Since Hollywood started taking an interest in sailing, one can expect a certain Americanization of the past time. With that, comes the American penchant for acronyms. A condition that I have been aware of since my earliest days of passage making now gets it’s own acronym. GOWS. As in, “he is suffering from GOWS” or “it looks as if she is over the GOWS now”. Going On Watch Syndrome. GOWS. There are very few exceptions to the rule that everyone suffers from GOWS at some stage in their early sailing career. 1. Incomprehension. “Are you talking to me?” “Who are you, what do you want? Leave me alone!” The sufferer displays signs of amnesia and lack of awareness of his/her surroundings and often reacts by pulling sleeping materials over his/her head in an effort to return to more familiar surroundings. 4. Categorical imperative. The realization that we are literally and figuratively “in the same boat” and we all have to contribute as much as we can to the common cause. The sufferer eventually emerges from the relative comfort of the bunk and begins to dress appropriately for the conditions. *for an explanation as to what what this actually means, please refer to my philosopher son. 5. Dawdling. Creating the appearance of preparing to go on watch. This can be a self defeating exercise. The longer the sufferer maintains the appearance of getting dressed, the greater the chance of getting severely injured in the process. NASA spends huge amounts of money to simulate weightlessness for aspiring astronauts when they could fairly inexpensively go sailing with a small boat in a big sea while attempting to pull on foul weather gear and safety harnesses. The difference is that the areas below decks on a small yacht are not padded like NASA’s simulators. 6. Procrastination. As in finding any reason to stay below decks. “Can I make you some coffee?”, bellowed to the current helmsman hopefully. “I need to check the bilges/GPS/chart/cereal situation/biltong stocks” etc. This step is quite often bypassed by sufferers with a tendency for ‘mal de mer’. 7. Acceptance. With a huge sigh, the sufferer emerges to perform his/her watch duties with more often than not, a massive dent into the time remaining on watch! Experienced yachties have turned this sequence into an art form! * names have been excluded to protect the identity of people that I have sailed with in the past, one of whom has been known to conduct his watch keeping from a sleeping bag on a saloon seat, using a remote control to switch between TV, radar and chart plotter on the flat screen. Fortunately we have no GOWS sufferers on this trip. The crew has been fantastic in every aspect. Especially enthusiasm. Could ignorance really be bliss? I don’t think the Indian Ocean wants us here! Books have been written about the best times to cross the various oceans and the routes to follow to minimize one’s discomfort and maximize the efficiency of travel under sail. I’ve read a few of these and they are pretty much unanimous in the paucity of recommendations for sailing from Cape Town to Mauritius in July. From this I can deduce that a) there isn’t much of a market for this information or that b) it is such a bad idea that it was never envisaged that anyone in their right mind would undertake such a passage. After 10 days of this trip, I’m beginning to think that b) is the more likely. From a few hours into Day 1, we had contrary winds. We knew they were going to happen and we were comfortable with that. We needed to get south so a South Easter was not the end of the world. Three days of it, followed by a day of strong Easterly winds and then a week of howling North Westerlies with very large seas was really not in the plan! I must commend my crew for their perseverance and maintaining of a sense of humor during some very unpleasant days. All this time Anita has kept us so well fed I believe we are putting on weight! I mean, who bakes muffins and bread heeled at 30 degrees with a boat lurching from side to side and the wind blowing at over 30 knots? With the crew that are relatively new to sailing getting more and more competent, the watch system has been revised from two watches doing 3 hours on and 3 hours off at night and 4 hours on and 4 hours off during the day. We are now operating on 4 single person watches doing 2 hours on watch, 2 hours on standby and 4 hours off. This gives us more time to read and more importantly, to watch series like “Breaking Bad” or “Shameless”! I somehow don’t think they had this sort of luxury on the square riggers of yesteryear? Those sailors were the real deal, not like us softies with our Goretex fabrics, GPS, AIS and down duvets! To say nothing of fridges and pressurized water. Author syjerricanPosted on August 5, 2014 August 7, 2014 Leave a comment on I don’t think the Indian Ocean wants us here!